You can now upgrade previous version Common Data Service (CDS) databases to the latest CDS for Apps. This upgrade process also helps you upgrade any apps or flows that currently use the previous version CDS database so that they will work with CDS for Apps. Now is the time to start upgrading your databases and the apps and flows that use them. Earlier, we announced that the service would be discontinued on March 15, 2019. We are providing the option to extend this period if you need more time to complete your upgrade. Important: If you intend to upgrade your previous version CDS database, you must start the first step in the upgrade process before March 15, 2019. If you begin Step 1 before March 15, 2019 you can continue to complete the upgrade until the service is discontinued. We intend to continue the service until April 15, 2019. If you do not start Step 1 before March 15, 2019, we will disconnect your database and store your data for 30 days before deleting it. If you wish to reconnect a database, you must contact support before March 29, 2019. We are aware of some databases which have unusual circumstances who will require some extra help, and will will be reaching out to them next week. We have also provided a way to skip the upgrade and just get a new CDS for Apps database for your environment. If you are interested in this option, see Skip upgrade and just get a new CDS for Apps database below. Which CDS is this for? Released in 2016 with PowerApps. Common Data Service for Apps CDS for Apps CDS 2.0 Released in 2018 with substantial enhancements over the previous version. Data Service for Apps! (Spring Update). This upgrade will upgrade your CDS database, including any apps or flows that use it to a CDS for Apps database. For most people, if you started using PowerApps after March of 2018, you should already have a CDS for Apps database, so this upgrade is not for you. Note: People who started using a Microsoft Dynamics 365 for Talent environment before October 1, 2018 will need to upgrade. When you view your environments using the admin portal (https://admin.powerapps.com/environments), you will see an Upgrade now link for any environments still using the previous version of CDS. When you view the environment, you will also see a banner and an Upgrade now button. Either the link or the button will take you to a page that will guide you through a three-step process. The three-step process helps minimize the down time required when the final step completes the upgrade. It also helps coordinate apps and flows created by different people. While this process has three simple steps, the complexity of the upgrade process will depend on how you have used the previous version CDS for apps database and the number of apps and flows that are using it. If you intend to upgrade, please start right away. Tip: Expect the first step to create a test database will require at least 4 hours to complete. Click the button and continue with your day. Come back later and see how it went. 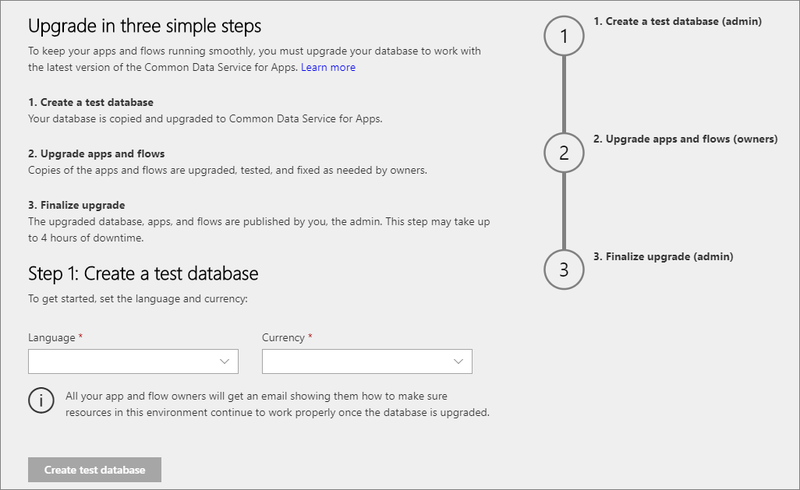 You can learn all about the process in the Upgrade to Common Data Service for Apps documentation. While you have a previous version CDS database in your environment, you cannot add new CDS for Apps database in that environment. Perhaps you never created any apps or flows using the previous version CDS database? Or perhaps you just evaluated it and don’t have any apps or flows connected to it that you currently use? If you are eager to get a new CDS for Apps database in your environment and you don’t care about upgrading any existing data, apps, or flows you can just delete your previous version CDS database and add a new CDS for Apps database. You can be done in just a few minutes using PowerShell. For information on this option, see Delete your previous version Common Data Service database. If you aren’t comfortable using PowerShell, you can contact PowerApps support and request this be done for you. In the coming weeks will send email notifications to all tenant and environment admins where there are environments still using the previous version CDS database. We will also monitor our telemetry for the upgrade process to ensure everyone who wishes to upgrade can be successful. Important: If people take no action, we will expect that they are not interested in upgrading and their databases will be disconnected on March 15, 2019 and deleted after 30 days.